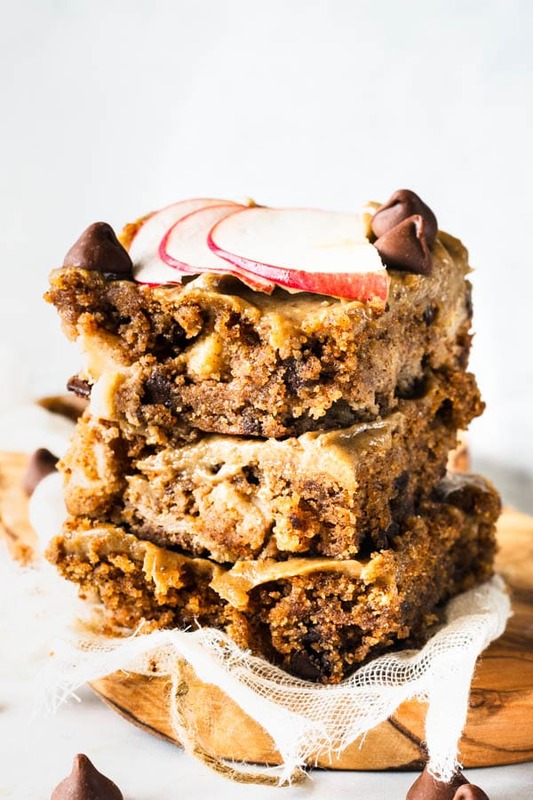 Vegan Apple Bars with Caramel Frosting. One more Vegan dessert recipe for the books. You can find some more vegan desserts here. With fall baking in mind, I also had vegan baking in mind. As I always do. Since I absolutely love to explore vegan baking more and more. 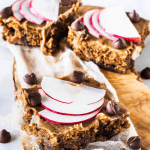 This recipe for my vegan Apple Bars also happens to be gluten-free and paleo. And ALSO happens to be incredibly delicious! I totally just ate a huge slice with a dollop of almond yogurt on top! Life is great, guys! Did I mention these vegan bars have chocolate chips in the batter? Yeah, so I added chocolate chips to the batter. As well as chopped apples. 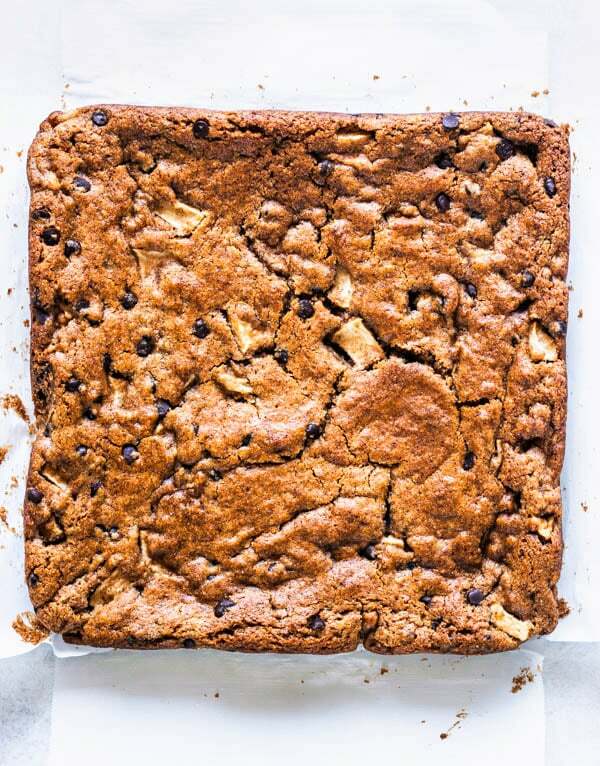 I used brown rice flour in my vegan apple bars, but you can use another flour if you want to. I am thinking that almond flour, coconut flour, or a blend would work really well too. Also, I used almond butter, which you can feel free to sub for any other nut butter. Same with the almond milk and almond yogurt used in this recipe. 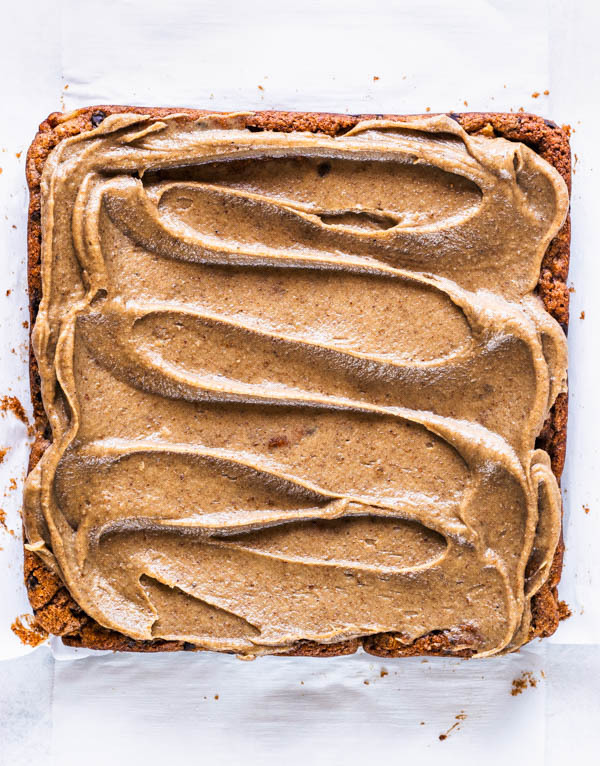 Now let’s talk about the Vegan Caramel Frosting on top! Flavorwise, it was completely incredible! I was stopped on my tracks once I tasted how delicious the frosting turned out. And so easy to make too! I am telling you, my vegan frostings might take the place of my regular frostings someday. 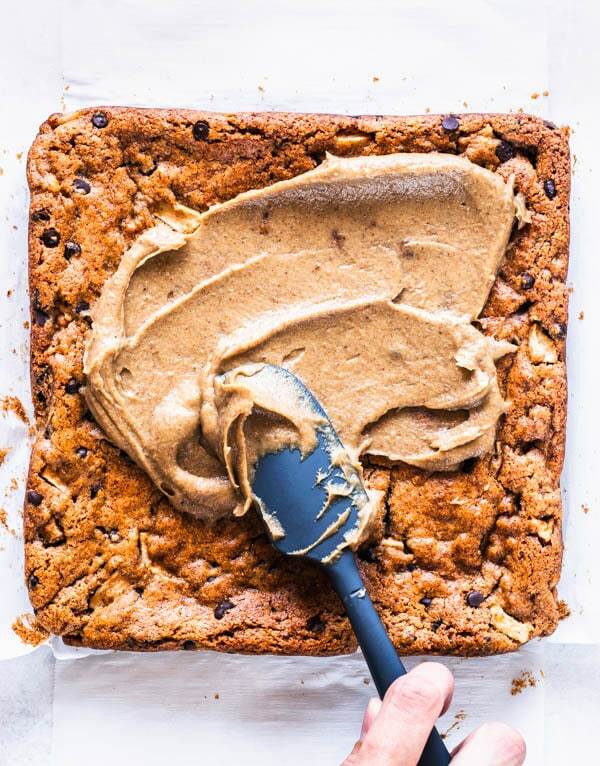 Same thing with the frosting I used on my Vegan Cookie Dough Bars, which is a delicious vegan chocolate frosting that will amaze you too! I am so excited to experiment with vegan frostings more and more. Someone requested that I do a #cupcakemondays with a vegan/paleo cupcake. Since I take #cupcakemondays pretty seriously as you can see with all of my Cupcake recipes, I decided to take the challenge. Actually, I tried to make vegan cupcakes happen a couple weeks ago, but my experiment failed. So I will have to keep trying! 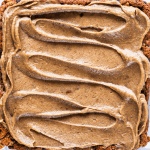 And this vegan Caramel Frosting really motivates me to keep searching. 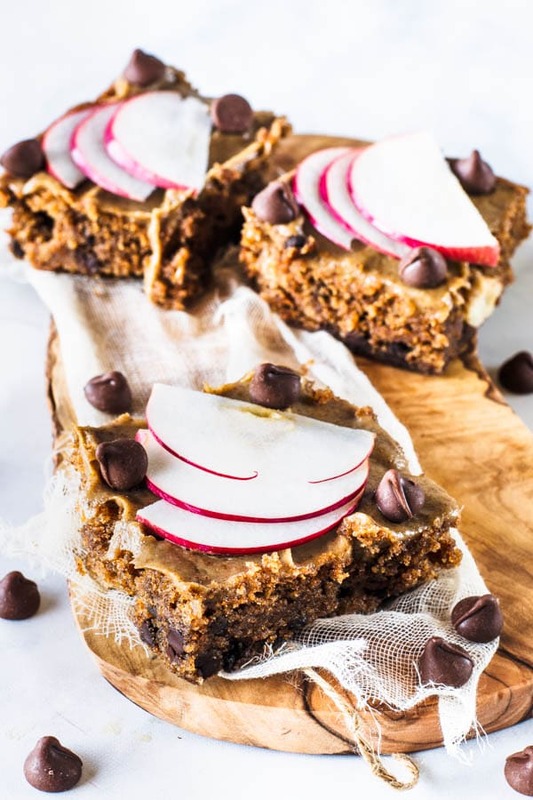 Don’t these vegan bars look super decadent and amazing? 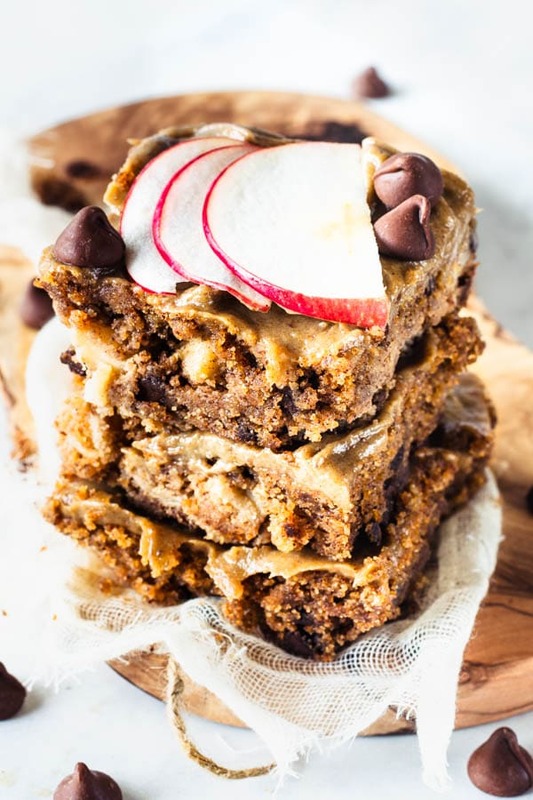 I hope you like today’s recipe for these delicious vegan Apple bars with vegan Caramel frosting!! Have a blessed day. Thanks for taking the time to read! 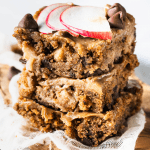 If you like vegan recipes, check out my other vegan desserts: Vegan Cookie Sandwiches, Vegan Strawberry Cheesecake, Vegan Cookie Cups with Raspberry and Peaches, and the most popular on the blog, Vegan Peanut Butter Tarts. Sempre uma receita melhor que outra!!!!! Parabéns!!!! !